I made Lemon Blueberry Scones recently. Houseguests took us out for a delicious and lingering breakfast and no one was hungry come lunch time. We waited until about 2:30 and had tea instead. Sliced melon, strawberries and other fruit, some cheese and deviled eggs made up the menu, but the star of the show was Lemon Blueberry Scones. 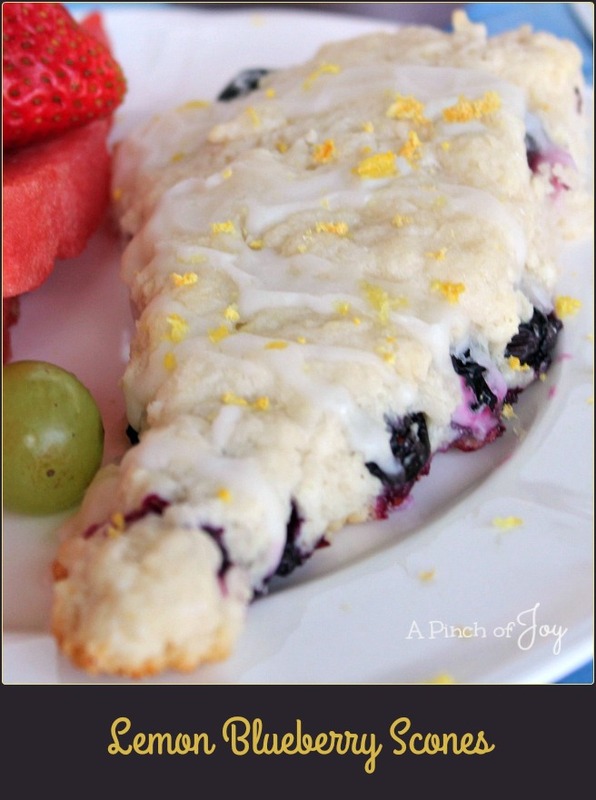 Light and flaky, full of delectable blueberries and a whisper of lemon topped with sweet lemon glaze — mmmm! Cut the butter into the flour and other dry ingredients quickly with a pastry cutter. You can also use a fork or two knives. The result should look like coarse cornmeal. Add the liquids and mix thoroughly but with a light touch. Overmixing will make the scones tough. Everything was breezing along and then I hit a road bump. Big or small berries, be sure to dust the work surface with a couple of tablespoons of additional flour before rolling out the sticky dough. If dough is too difficult to work, sprinkle more flour over the work surface and then sprinkle an additional tablespoon of flour over the dough. For large berries, divide the dough into two equal portions. Roll/pat the dough into a quarter inch thick square, then spread the cup of blueberries over of it. Repeat the process and put the second dough half over the berried half and pat it all together. I cut the dough into wedges like this: \/\/\/\/\ for eight pieces. The dough is very tender and needs to be handled with a light touch and a big spatula. Mix the lemon glaze while the scones are baking and drizzle it over the slightly cooled pastry. Cool for around 30 minutes before serving warm. They are also excellent served the next day, so make ahead of time, if you wish. Add a bit of fresh zest to the scones just before serving. The extra zing of tartness on the tongue is perfect. The fragrance lights up the room wonderfully. The star of the table, light and tender scones full of sweet blueberries offset by the zing of lemon. Preheat oven to 375. Line baking sheet with parchment or silicon sheet and set aside. Measure dry ingredients into large mixing bowl. Add butter, cutting into chunks. Use a pastry cutter or fork to cut butter into dry ingredients until it is the texture of sand or coarse cornmeal. Add butter and lemon juice and stir with soft rubber spatula until just mixed. Do not overmix. Dough will be somewhat sticky. Sprinkle about 2 tablespoons of additional flour onto clean work surface and knead about three times to bring the dough together. Sprinkle dough with additional flour if necessary for handling. Roll/pat dough in an 8 inch round*. And cut into 8 equal wedges. Using a large spatula, transfer wedges to baking sheet. Leave about two inches between each scone as they will spread while baking. Bake at 375 for 15 minutes or until lightly golden. Let cool for about 5 minutes before removing from baking sheet. Mix together powdered sugar and lemon juice for glaze. Remove scones to serving plate and drizzle with glaze. Add a bit of fresh lemon zest to each scone and serve warm. *See comments above for alternate directions on how to incorporate large berries.